Martin Jonas is a premier South African corporate and club comedian. 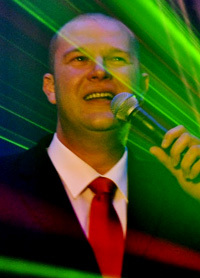 Martin Jonas hosted the South African Music Awards for two consecutive years and has headlined the Heavyweight Comedy Jam. He was featured in the South African Comedy Festival in Hammersmith, the SA Heavyweight Jam in London’s West End and several comedy clubs in the UK. Martin Jonas has performed at corporate functions in Mauritius, Namibia and Swaziland and was featured on DSTV's Comedy Central Africa. Recent highlights include appearances for Parker’s Comedy, the South African Feedlot Association, the South African Civil Aviation Association, an awards ceremony for Toyota and he was the MC at the Gauteng Provincial Legislature Golf Day for the past two years. Martin Jonas`s brand of comedy is observational and his repertoire includes unique impressions.